My resume tells it all. I love to work, I always have. But I haven’t always done work I loved, and there’s a difference. I’m 51 now, and my resume tells the story, and journey, of so many women. It reflects the many ages and stages of my life, the crossroads I have come upon, some foreseen and others unexpected, and the often complicated choices I have made along the way. It is through this two part blog series that I pay homage to all women, past, present and future; and offer my thoughts on what it means to be part of this lineage. Professionally, I sit here now as a Senior Partner at InspireCorps and part of a team of extraordinary women leaders, and personally, devoting my time, attention and energy to things that matter most to me. I am enjoying my work and life in ways I never imagined I would. As we celebrate Women’s History Month, I am struck by the ways my life, personal and professional, has been impacted, influenced and inspired by women. I am also mindful that women continue to fight for equality, full expression of their rights, and a pathway to be, do and create whatever they desire in each stage of their lives. 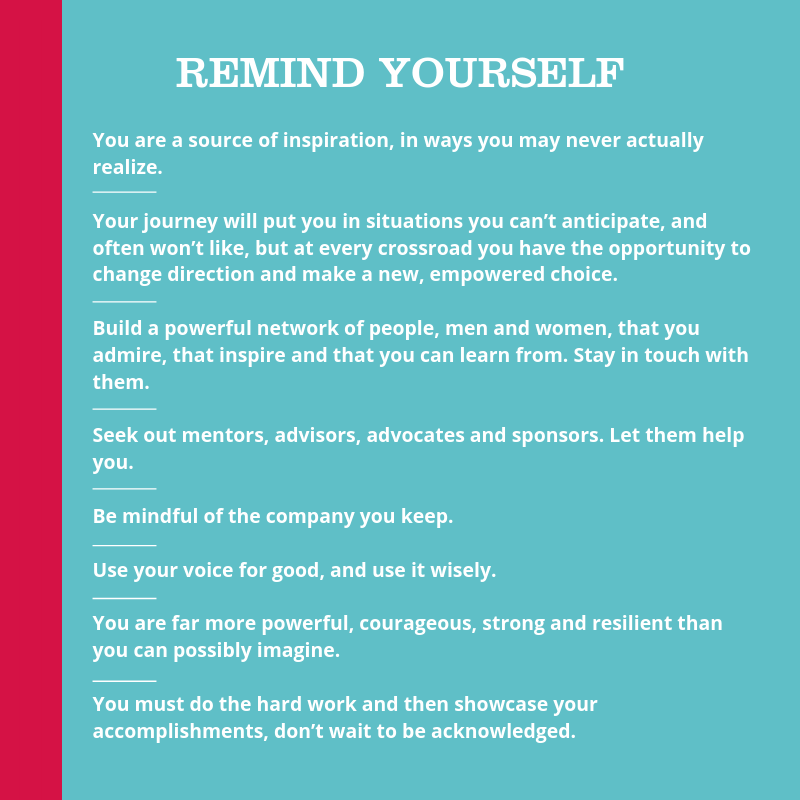 As we take time to celebrate women and look back to look forward, I want to share the most important lessons that I have learned along my journey so far. I hope these serve as reminders not only for women, but for all of us. There is a part of me that has always leaned in. Not so much by the Sheryl Sandberg definition, but as a lifelong seeker and learner. Curiosity, or if I’m honest, a bit of FOMO (fear of missing out), has always led me to want to know more, to be more. I was, and continue to be, eager to learn and to acquire new knowledge and skills. I read a lot, ask all kinds of questions, and seek out people who I believe have something interesting to share with and teach me. I learned a long time ago that who I surround myself with will either support or obstruct my ability to get what I want. Hundreds of women have come before me and paved the way so that I can become the woman and leader that I am today, and that I will become. They are the famous women, the underdogs, the warriors, the creators and the trail blazers. They are the women we see in history books and those we honor as part of our national celebration, reminding us of their courage, boldness, and fierce determination. I remain deeply humbled and inspired by them. What I realize now is that there are hundreds more who have played a role in my life, who by their tenacity, words and acts of kindness and bravery, contributed to my own strength as a woman. Most astonishing is that they most likely don’t even know it. My mother, the most extraordinary woman and role model. The woman in my extended circle of moms who fought, and lost, her battle with pancreatic cancer with more grace and dignity than I have ever seen. I learned so much from her. The many women on Facebook that I watch, follow and observe from afar. They are the ones that share the rawness of their lives so openly, honestly and courageously; using their voices to speak truth and as a force for good. The hundreds of women I coach who open their hearts and souls to me, and who are doing the hard work to show up as the best versions of themselves as they balance the many roles and responsibilities they hold. Each and every one impacts me. As I cross the threshold of becoming a modern elder, I have discovered that not only do we, as women, often diminish our own capabilities and power, but also grossly underestimate the powerful impact we have on others. There isn’t usually acknowledgment or fanfare around our impact. We have to realize the power of what we say and do, and know that through these, we do make a difference. Just as I have been impacted, I know that I have had an impact on others. I know this from the public and private notes that I receive from those I have touched over my many years. It looks like hearing from the daughter of my friend that lost her battle with cancer, who shared that she follows me closely on facebook and wanted me to know just how much my posts inspire her, especially as she mourns the loss of her mother. It is in all of these ways, public and private, direct and indirect, subtle and overt, that women lead from generation to generation. It is powerful and beautiful. It is what sets us apart.